The Greater Atlanta Home Builders Association was proud to re-introduce its county chapter system in 2018. The localized chapter system breaks our larger metro Atlanta are down into smaller geographic regions, allowing members to enjoy hyper-local networking and educational opportunities, as well as socials and community service projects throughout the year. Attendance at chapter events is a great way to stay up-to-date on specific issues or subjects that are relevant to the local city or county in which you work or reside. The first event of 2019 will be on Thursday, January 24 from 11:30 a.m. to 1:30 p.m. at The Reserve at Celebration Village. 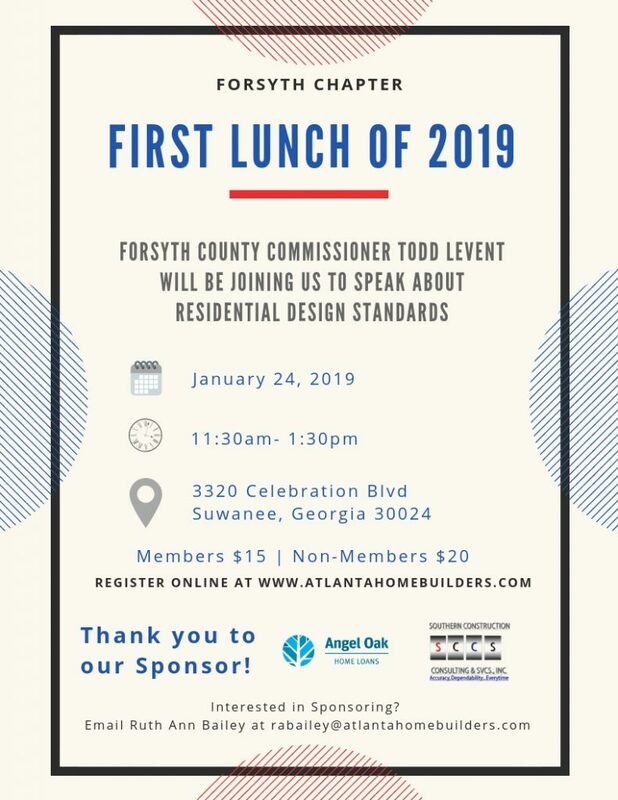 Forsyth County Commissioner Todd Levent will be attending to speak about residential design standards during the lunch, which is $15 for GAHBA members and $20 for non-members. Thanks to sponsors Angle Oak Home Loans and Southern Construction Consulting and Services, Inc.! Register here to attend this event before it sells out! Stay tuned for details on future events happening Thursday, April 25 and Thursday, June 27. Join DeKalb County Director of Planning and Sustainability Andrew Baker on Tuesday, January 29 at 11:30 a.m. at the Greater Atlanta HBA office for the first DeKalb/Rockdale Chapter meeting. Andrew will be presenting a State of the County address and updates on permitting. The lunch event is sponsored by Pestban, Norbord, Capital One Spark Business and Fidelity Bank Mortgage, and is $15 for member registration and $20 for non-members. Register to attend by clicking here. The chapter will also be participating in a combined March Madness social with the Inner Atlanta Chapter. Free to all members thanks to a sponsorship by The Erosion Company, the event will take place on Thursday, March 21 at 4 p.m. at Five Paces Inn in Atlanta. Stay tuned to the event page on the GAHBA website for more details! 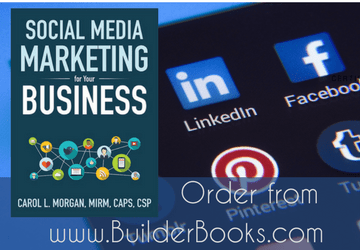 Finally, save the date for a chapter social event on Thursday, April 18 in the evening, as well as a luncheon on Thursday, June 20. 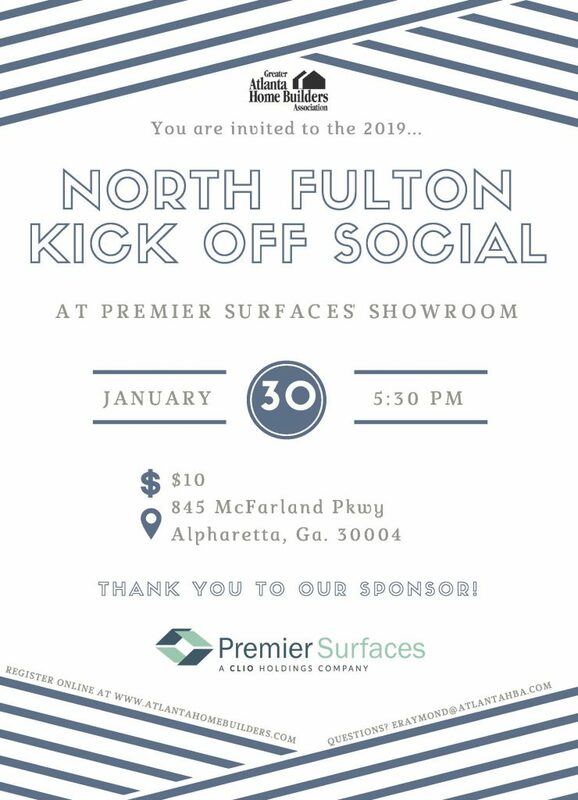 The North Fulton Chapter will host its kick off social at the Premier Surfaces Showroom in Alpharetta on Wednesday, January 30 at 5:30 p.m. This fun social event is just $10 to attend, and registration is now open. Mix and mingle with the Cobb/Cherokee chapter on Wednesday, February 6 at 6 p.m. during the kick off social at The Nest in Kennesaw. This fun event is just $25 to attend, and it includes food and drinks! Register here for what is sure to be a sold-out event. The Gwinnett Chapter will host its first lunch meeting of 2019 on Thursday, February 7 at 11:30 a.m. Featuring Charlotte J. Nash, Chairman of the Gwinnett County Board of Commissioners, the event will be held at Laundry Events in Lawrenceville. Sponsored by Opendoor, the luncheon is $20 for HBA members and $30 for non-members. Register for this event here. Head intown on Thursday, February 28 for the first Inner Atlanta Chapter meeting. Held at Southface Energy Institute at 11:30 a.m., the event will feature speaker Doug Maples, Assistant Director, Plan Review Division, Office of Planning, City of Atlanta. Registration opens online soon, so stay tuned! Don’t forget to save the date for a second Inner Atlanta Chapter luncheon on Wednesday, April 24. Network with fellow industry professionals on the southside on Tuesday, March 12 at 5 p.m. at the Shamrock Community Use Building in Jonesboro. The event will feature speakers from the Clayton County Board of Commissioners including Chairman Jeffery Turner and Commissioner Felicia Franklin Warner. The event is $15 for members and $25 for non-members, and registration is already available online. Plus, save the date for a future event happening Wednesday, May 1! Most chapters still have sponsorship opportunities available for 2019 meetings and events. To learn more or to find out who to contact regarding available sponsorship opportunities, visit the individual chapter pages on the GAHBA website.